Eric Devin writes a detailed tactical analysis of the UEFA Champions League match that ended PSG 4-0 Barcelona. In parsing Paris Saint-Germain’s 4-0 defeat of Barcelona Tuesday, it is clear that individual performances had more to do with the result than did tactical ploys or missteps on either manager’s part. Nevertheless, there is something to be gained from an examination of the match, particularly on the part of the hosts. Despite playing a familiar system with an unsurprising set of personnel, the subtle wrinkles added by Unai Emery allowed PSG to stretch space in attack while also maintaining their shape defensively. 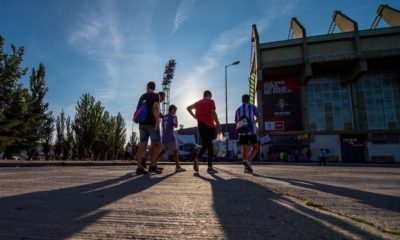 Barcelona’s players struggled to respond, particularly Sergio Busquets, as Iniesta and Gomes don’t necessarily project as box-to-box midfielders in the strictest sense of the word. Sensing the need to aid the attack, Busquets continually pushed forward, seeking to close the space that manifested between the front three and midfield. 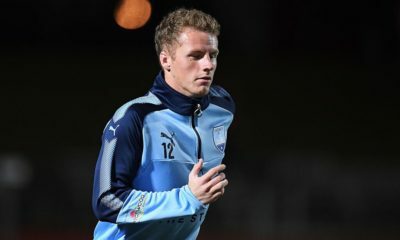 However, given that he is far from gifted with the ball at his feet, there was nothing to be gained from these forays. 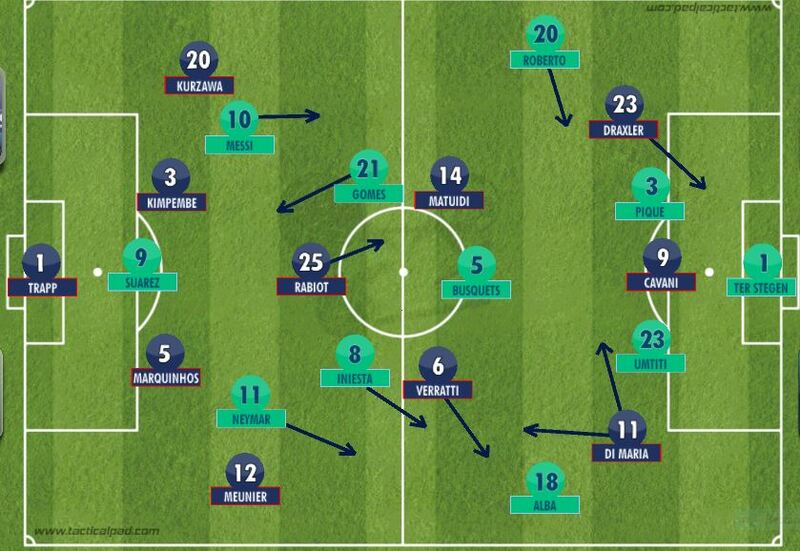 This, combined with the movement of PSG’s front three, sowed mass confusion for the visitors. The movement of the front three pinned back the fullbacks, Alba and Roberto forcing them to play with less width than usual. Iniesta and Gomes, both strong with the ball at their feet but neither the quickest, often were forced deep to receive the ball, meaning that Barcelona’s proclivity for short, quick, passing was made difficult to execute. 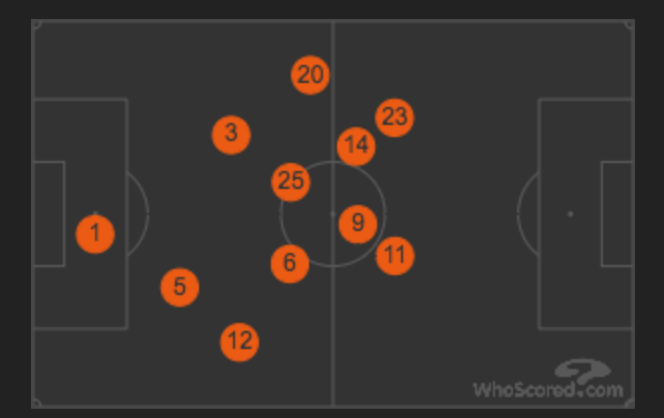 The first image here shows the average player positions for Paris Saint-Germain. The hosts nominally played a 4-3-3 but as the image shows, it functioned in practice as more of a 4-2-4. Meunier and Kurzawa (12 and 20) sat deeper than they do habitually, more often tucking inside to double the runs of Messi and Neymar, while ahead of them, Rabiot and Verratti played as box-to-box midfielders, protecting the defense whilst also joining the attack on occasion. This freed the tireless Blaise Matuidi (14) to make runs into the box as an auxiliary attacker. Matuidi isn’t the most nuanced of players, but he does offer enough of a goal threat to drag defenders out of position. This was further exacerbated by Di Maria and Draxler’s freedom of movement. 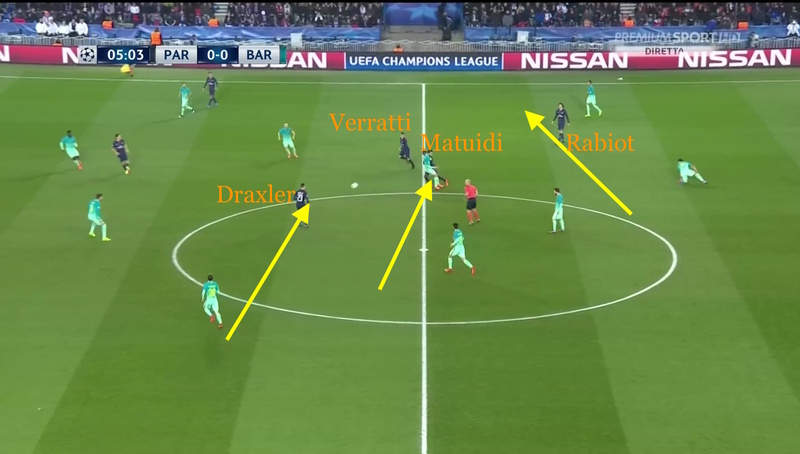 Both cut inside at will and even switched flanks on occasion; combined with Cavani often dropping deep, either to press Barcelona’s midfield or to offer an outlet for the midfield; thus, the front six enjoyed near-total fluidity of position. PSG’s preferred tone for the match in this regard was set almost immediately. Adrien Rabiot was nominally the defensive midfielder but those familiar with his style will know he is also a player who has the odd forward run in his locker (see his goal against Chelsea in this competition last season). 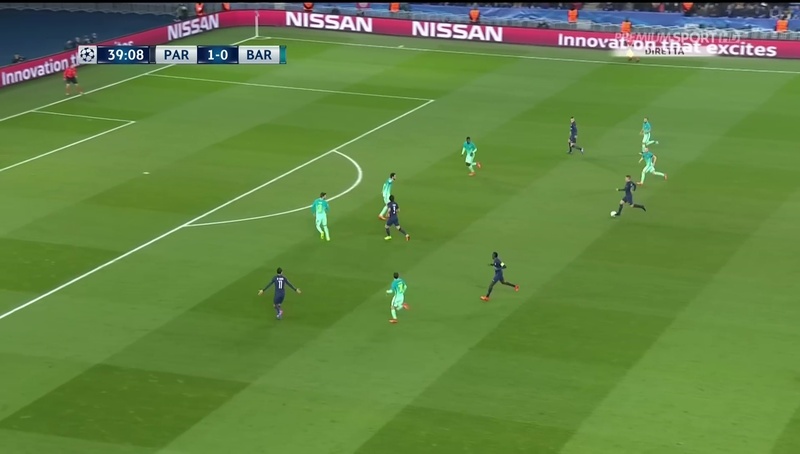 His lung-busting run in the match’s first minute, shown here, may not have come as a total surprise, but his getting forward, even as he generally protected the back four, would have lingered in the minds of Barcelona’s midfielders, engendering a certain level of trepidation. These two images show a further extension of that fluidity. In the first, as Barcelona react to losing possession, we see that PSG’s entire midfield has shifted over, most notably Draxler and Matuidi. Rabiot has done as much in a deeper role, indicated by the yellow arrows. Thus, as Verratti seeks to build play, he is not only left with no shortage of options for an easy pass, or a one-two, but Barcelona’s midfield and defense has shifted over entirely, leaving them ripe for a switch of play to an overlapping fullback. 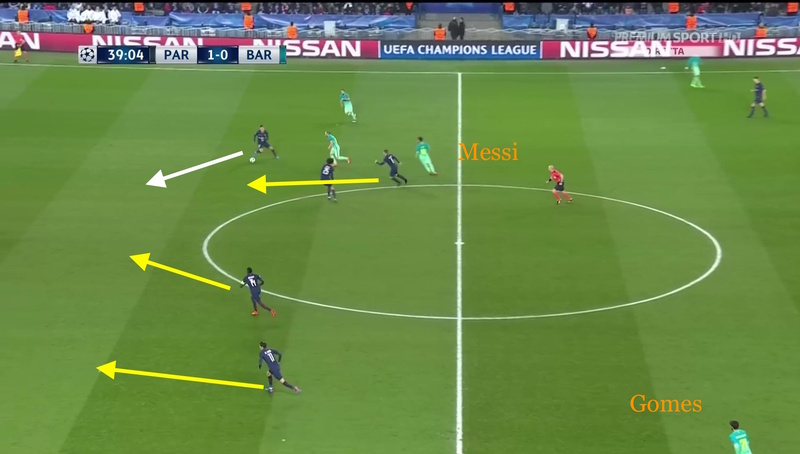 As previously mentioned, on the night, Kurzawa and Meunier tended to sit fairly deep to deal with Messi and Neymar, but the second image shows that an outlet for a switch of play need not come only from a fullback. Here, the yellow arrows indicate the movement of Cavani (top) and Di Maria (bottom). The white line shows the shape of PSG’s midfield, and Draxler is in his normal position on the left flank; besides the two South Americans having switched positions, this would seem a fairly normal passage of play, but for the reactions, or lack thereof of Barcelona’s defenders. Busquets, who functions at his best when aiding the defense, is caught in no man’s land centrally, neither pressuring the ball nor providing an extra man to deal with the front three. Alba, to his credit, does seem to have recognized Cavani peeling wide, but Piqué and Umtiti face the ball, seemingly unaware of Di Maria’s having moved inside. Draxler is in a similar amount of space on the near side, and this lack of focus was on display throughout the evening. However, it wasn’t only the defence that was to blame on the night. This sequence, which was the build-up to the free kick from which Di Maria scored, shows Barcelona’s back four (white line) holding a good shape, with Cavani well-covered. The ball (red circle) has been played over the top by Verratti (that fluidity once again, as the Rabiot gets forward in his stead) to Meunier on the right flank, and the defenders are tracking its movement, ready to react as Matuidi also gets forward. Busquets trails PSG’s captain, and while his positioning could be improved upon he is hardly the guilty party here. That honor goes to Iniesta, who is failing to react to the ball’s movement. Verratti is nominally his man, but rather than pressing high up the pitch to pressure him, Iniesta is, like the defenders in the previous set of images, caught in two minds. His poor positioning has left Meunier in acres of space, and what unfolds is almost inevitable. Meunier executes a short dribble, before laying the ball off for Di Maria, which sets the scene for the second image. The right back then runs past Di Maria on the inside, pulling Alba away from his fellow defenders (yellow arrow). 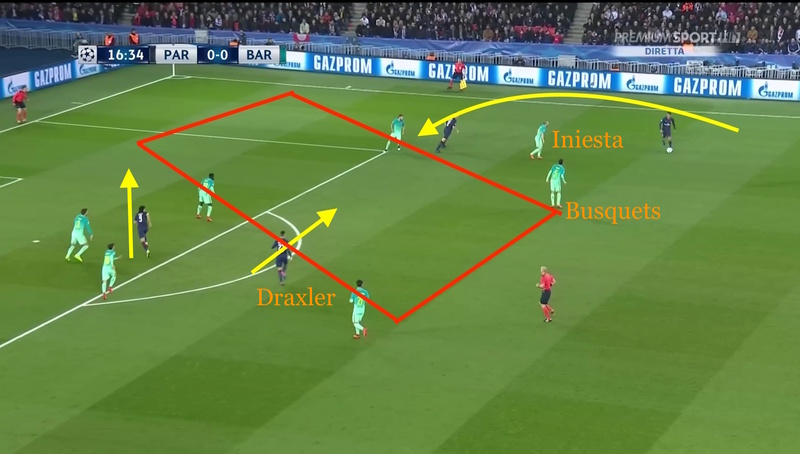 However, neither Iniesta nor Busquets have moved to put pressure on Di Maria, or tracked the run of Draxler centrally. Cavani is engaged in his trademark diagonal run, which occupies the two center backs; the cumulative effect is that Draxler has a huge area to run into (red box), and ends up being clumsily tackled by Umtiti just outside the area. If Iniesta and Busquets are to take up positions away from those which are more customary, it needs to be to some effect. Merely standing near Di Maria doesn’t put him under any pressure, and this, too was a recurrent theme for the visitors. While this style of play shows PSG building play patiently, the French champions were also deadly on the counter, as this pair of images shows. However, rather than the midfield or the back four being derelict, it was the attackers who shirked their responsibility in this instance. Lionel Messi and Neymar rarely take the effort to track back in the customary manner; their preference instead is to try to win the ball back more immediately after losing possession. 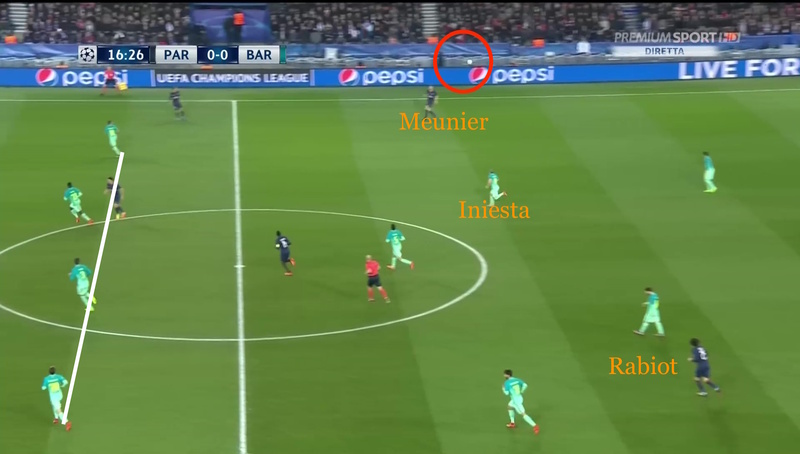 However, with the front three so isolated, this became dangerous as Gomes and Iniesta sought to close that gap. In the first frame, Iniesta is caught in possession, and PSG stream forward (yellow arrows) as Draxler cuts inside with the ball at his feet (white arrow). Matuidi and Di Maria (again, having switched flanks) are in acres of space, but Barcelona still have a numerical advantage. In the second image, four seconds later, we see how that attack evolved; Matuidi and Di Maria have continued their runs, while Draxler pulls wide on the opposite flank. Iniesta pursues Verratti, who has the ball at his feet, but Gomes and Messi are nowhere to be found. Instantly, PSG have a numerical advantage simply due to the laziness of Barcelona. These sets of images are but a few examples, but the bottom line is that PSG were simply hungrier on the night. The hosts’ movement and positional discipline won them the match; there is no doubt that Barcelona are a more talented side man-for-man than the Parisians, but a well-executed game plan meant that victory was well within the hosts’ reach, a testament to how superlative can performances can be delivered by good teams simply by functioning as a whole.